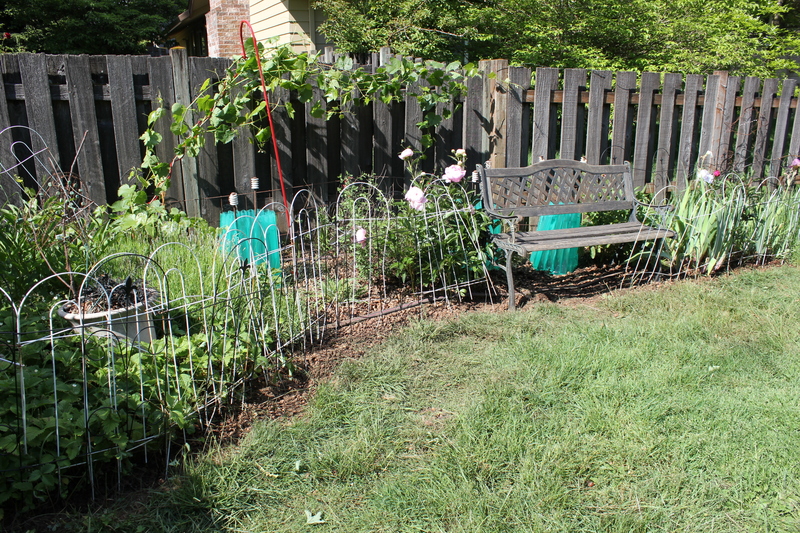 I spent a few hours tackling the weed – er, flower – beds yesterday. It was on the cool side and we’d had a little rain to make the ground soft for easy work, so I thought I’d make a brave attempt to get caught up on what has been a banner year for weeds. The window of opportunity was pretty narrow. This year, I am more in tune to the fact that my body can no longer endure the hours and effort necessary for a beautiful yard: I need to take this a little at a time and not over-do in a single given day. One day of over-doing = three days of recuperating. I hate it, but it seems to be my new reality. I was actually thankful it was cooler out: the cottonwood was not floating down like snow which meant I could breathe without sneezing. The cool also put a damper on the grass pollen. I actually made it without a single sneeze. Time was, I could tackle the entire north bed in a single day of work. I decided to just start in the middle this time so I could plant my pale-looking heirloom tomatoes before they died in their little coconut fiber starter pots. 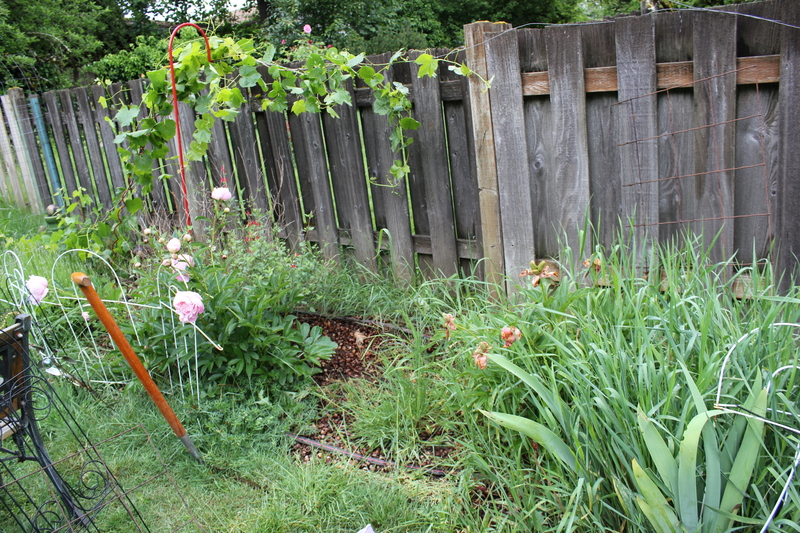 If I could clear enough room to plant those, then I would consider weeding to the left or right of center and see how far I could get. A word on the tomatoes: Don has a vegetable garden. 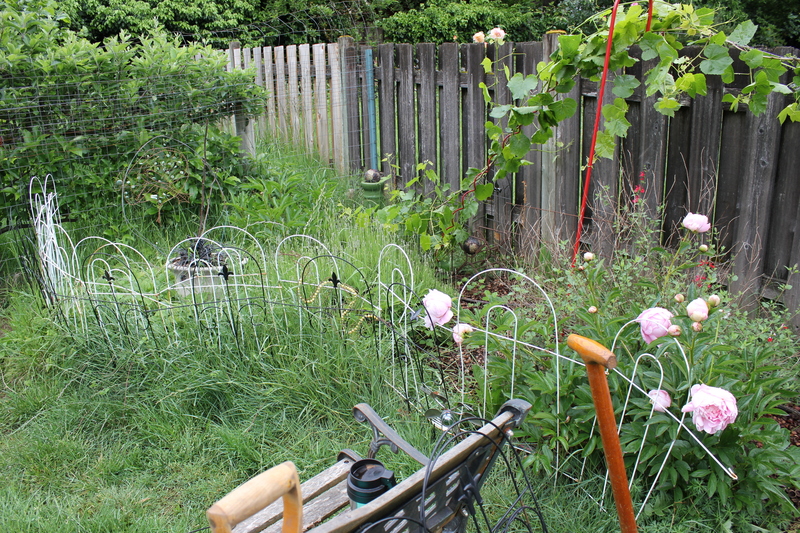 It is currently under 3′ of grass and weeds. He hasn’t had any more time or energy than I have had and the weather has not been exactly cooperative in coordinating with our days off. He will plant traditional tomatoes and peppers in the big garden; these tomatoes are some heirloom seeds I picked out called ‘Abe Lincoln’. I planted them in little pots in the little window in my studio and have babied them for several weeks. I planted some sunflowers at the same time, but they molded and died. My tomatoes grew to about 8″ tall and then began to yellow. I’ve been hardening them off the past couple weeks, but their health hasn’t really improved and they haven’t grown much. So I decided I needed to get them into the ground where the roots can reach out and they can finally make some progress. Except that it’s going to be cold all the rest of the week. But no fear! Long ago, we bought those neat little tubes you fill with water and put around your tomatoes in cold weather to 1)keep them warm and 2) insulate them from the cold (which, I suppose, is the same thing). And I just happened to know exactly where those water tubes were (which is amazing since my house is a total disaster and the only place I have organized anymore is the potting shed. And even then, I forgot I already had a bag of steer manure. Go figure. I pulled my bench out of the north flower bed. 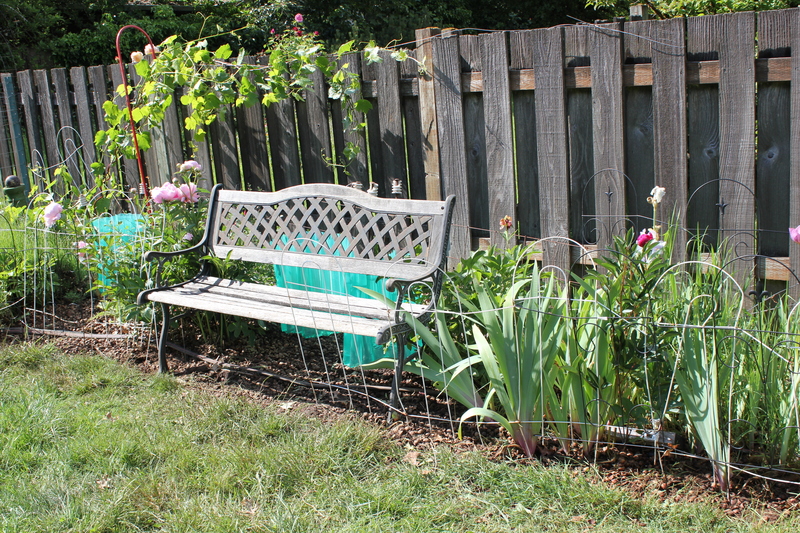 I really want the bench to go elsewhere (after I have weeded elsewhere). The stupid layers of decorative wire fencing are Anti-Harvey measures: but he still gets through and chews on the fence boards if we aren’t watching him. Those are my Before pics. After I got the grass pulled out of the irises and peonies. The tomatoes are hidden in the green circles. I had to put the bench back because Don wanted to mow the lawn and it was in the way. I edged and pulled for three hours and cleared only 2/3’s of the flower bed. My grape is going crazy this year (it had a slow start, but this year I will actually have grapes!). I was so tired by the time I reached this point. Two cups of coffee, a sandwich for lunch, and two glasses of water. Every muscle screamed. I laid down and rested with Harvey (he took a nap when he realized he wasn’t getting more belly rubs). Then I tackled this flower bed. 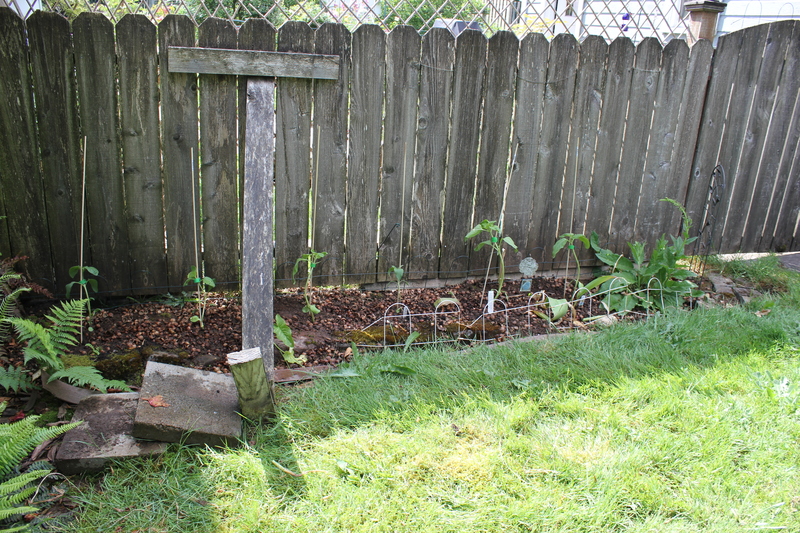 It didn’t have very many weeds, but I needed to plant the six sunflower plants I bought at Portland Nursery on Mother’s Day. We really need to replace the fence. I still have several plants to put into the ground, but by the time I’d reached this point in physical exertion, I knew I was due a hot shower and a lot of rest or I wouldn’t be able to get up and function on Monday morning. When did this become my new reality? It made it into the low 70’s today, but – of course – I was at work. Tomorrow, the rain and cold returns. Of course: it’s Rose Festival time.